If you have read my Milwaukee M12 LED Stick Light Review you would know that I am a huge fan of the cordless LED light. So when I had an opening for a giveaway I knew I had to try and team up with Milwaukee to give one of them away. Milwaukee Tool happily agreed to my request and also decided to throw in a battery and a charger. 220 Lumens of Bright, Even light. 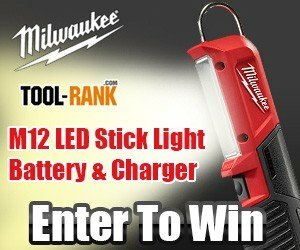 The giveaway is for (1) Milwaukee M12 LED Stick Light, including a battery and charger. So how do you enter? See the widget below and follow the steps. You have a total of 9 different ways you can enter this giveaway. You can enter using only one method or you can use all 9 and have more chances to win.